It’s a gorgeous day outside so why not go shopping? Indoors. In front of my computer. At the App Store. Yes, Apple’s App Store has arrived in iTunes via a free software update for older iPhones and the iPod Touch ($10 fee); it will be included on the iPhone 3G, available tomorrow. And it’s everything we hoped it would be, with a few exceptions. As you would expect, the App Store is easy to browse, shop, and purchase, just like it is in iTunes for music and video. It’s colorful, well-organized, informative, and fun. For now, though, I must window shop. The 2.0 software update hasn’t arrived for me to load programs and begin playing. Nevertheless, I could still shop, and I never even broke a sweat. It’s just like buying music or video. All apps are nicely organized into categories: New, What’s Hot, Staff Favorites, Quick Links, Top Apps, Top Free Apps, in addition to Business, Education, Entertainment, Finance, Games, Healthcare & Fitness, Lifestyle, Music, Navigation, News, Photography, Productivity, Reference, Social Networking, Sports, Travel, Utilities, and Weather. Each app page includes all the information you need to make a purchase: multiple screenshots (a nice touch), a (usually) detailed description, appropriate links (developer’s site, support, license agreement), and social touches like Tell A Friend. But if it’s a paid app, you are not given an option to send it to a shopping cart for later purchase. Click on “Buy App” and you’ve just bought it. Unfortunately, there does not appear to be any way of demo’ing an app before purchase. With more than 500 apps already available, there’s a lot to choose from. There’s plenty of travel-related apps, including TravelTracker, TopLog/1040, BA Flights, Expense2Go, and Nexonia Expenses. Many of these are cross referenced to other categories, including Finance, Productivity, and Travel. 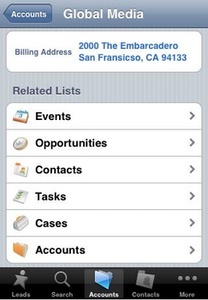 Of note to many is the free Salesforce Mobile app. Other than Sales Force, though, there are not many other big-name businesses here. Of course they may be developing applications for internal, rather than public, use, but still I wonder what kind of interface they can have with customers through a unique iPhone/Touch app. There’s lots and lots of translation programs, dictionaries, thesauruses, some very intriguing science apps like Molecules, Netter’s Anatomy and Neuroscience Flash Cards ($39.99 each), and math programs like Trigger (a trig cheat sheet) and Math Wizard. Right now there are 10 pages worth of entertainment apps. Guess we know people want to be entertained on their iPhones and iPod Touches rather than being productive. 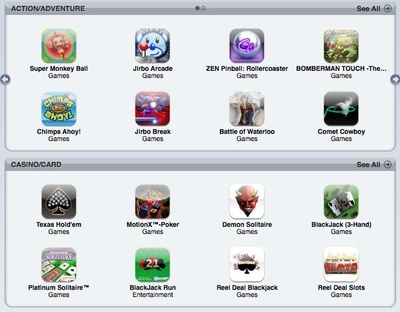 There’s the usual card (poker, solitaire, BlackJack) and puzzle (4 in a Row, BeeCells, Bejeweled 2) games. Go kart racing games like Cro-Mag Rally. There are music-making apps like Drummer, eBook readers and book content (why should I pay 99 cents for “Crime and Punishment” when I can get it for free elsewhere? ), and stuff I’ve never heard of. So get ready: You will spend hours here just browsing. As you’d expect, there bunches of calculators, tip-makers, loan analyzers, and budget programs. I’m intrigued by Mobile Banking from Bank of America (find ATMs near you, check balances, pay bills, transfer funds) and the PayPal app (send money on the go). These two seems very useful and meaningful to me and ahead of their competitors. As this is a big category, the App Store has done a nice job of organizing: action/adventure, casino/card, family/kids, racing/arcade, and puzzle/strategy. The real test here isn’t what is listed but how it plays, and for that I must wait. Grrr. There’s the Wheel, a pregnancy cycle app; MIM (for multi-modality medical imaging; and fitness recording/goal programs. I am intrigued by a series of apps from GoFitness for cycling, gym and home workouts, advanced fitness, hiking, and running (each program is $9.99). In cycling, for example, I can watch a video, learn about training, hydration and nutrition, and sports psychology, among others. There’s also a log to record rides. These will not replace actual instructors but could come in handy for beginners and intermediates. Lifestyle mixes in apps from all sorts of categories, but there’s also programs like eBay Mobile, bibles, shopping assistants, and voice recording. 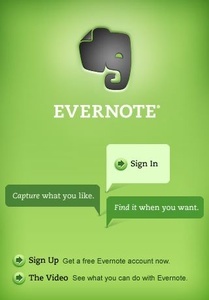 Evernote, a note-taking program I use, is listed, which makes me happy. But I don’t know if I can edit notes on the iPhone/Touch or just read. It promises true cloud computing between the desktop, Web, and mobile. There’s Pandora Radio and AOL Radio and lots of programs for the inner musician — OmniTuner, Pianist, iMetronome, Band. The radio programs are a nice addition, especially if you have a 3G phone. But where’s Last.fm? This will be a great category over time, as there are not a lot of apps to choose from yet. Even so, there are plenty of location programs like CityTransit, iTrans BART (NYC, DC), and other subway maps. I suspect we’ll see a lot more navigation and location-aware programs once iPhone 3G is available and people are using its GPS capabilities. Not much here yet, but what is here may be all you need. There’s the Associated Press Mobile News Network, the NYTimes, and RSS programs such as iRSS and NetNewsWire. Where’s the Wall Street Journal? Reuters? Heck, even my local paper should have an application here. There are the stalwarts: Mobile Flickr, SmugShot (from SmugMug), Phanfare, and Photobucket, and a few interesting ones like NearPics and Comic Touch (from plasq). Another mixed category. 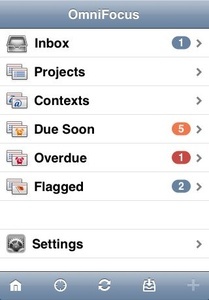 In addition to the personal task management programs like OmniFocus (yeah! ), Things, and To Do, there’s the TypePad blogging app, more voice recording, more shopping assistants, list makers, and outliners, and Jott for the iPhone. I was disappointed to see that there were no iPhone conduits for the many Mac note-taking productivity programs like Yojimbo, Journaler, Circus Ponies Notebook, SOHO Notes, and others. 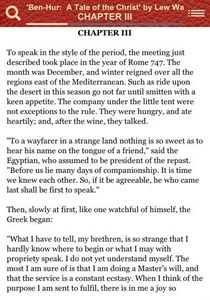 Lot of crossover with Education, with translation apps and phrasebooks, bibles, and eReaders. Google has a mobile app for easier search. AIM, Eventful, Facebook, Loopt, MySpace Mobile, Phanfare, Pownce, Shout It, ShoZu, Twitteriffic, Where, Whrrl. Need I say more? Even with some big names, why aren’t there more micro-blogging apps for Twitter, FriendFeed, Tumblr, and all the others out there? In addition to the GoLearn programs, there are bunches of apps for golfers — Golf Tracker, Hey, What’s The Golf Score?, Golf-Ace. SportsTap, which I already use as a Web app, is included and is indispensable for quick-hit sports scores and standings. And the most interesting one of all: MLB.com At Bat ($4.99). Oddly, where’s ESPN? The major sports leagues? The iPhone and iPod Touch are, of course, mobile, so you can expect oodles of travel apps. Most are language programs, phrase books, tip calculators, travel planners and expense trackers. 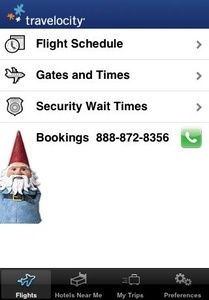 Travelocity offers TravelTools. Wonder where the other big travel companies are and airlines like American, Southwestern, Virgin, and others? Pretty much every little app ends up listed here. A good place to finish your window shopping. I hated WeatherBug on the PC. Maybe it will be better on the iPhone. MyWeather Mobile looks promising ($14.99 though), and for the pilots out there check out ForeFlight Mobile ($69.99!). There’s a huge amount of fanfare surrounding the grand opening of the App Store. But strip away the hyperbole and the App Store is a good, decent start to iPhone commerce, but it’s not stunning. It’s not what it’s going to be. Too many big name players — from software developers to actual businesses — are missing. Will they join the fun? My bet is that they will. Thank you for mentioning Nexonia Expenses. It’s been a pleasure to have been part of the Apple App Store launch. We think it’s going to be part of a large move to the mobile Internet. Thanks again. Neil (CEO). You’ve got the best write-up today, even if it doesn’t go into usage. 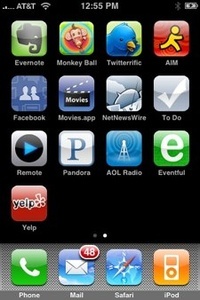 I’ve been looking everywhere for a browse-list of apps. Thanks! Speaking of ESPN, we may not be in the App Store yet but we did just launch a new version of our mobile site especially for iPhone. Please check it out at http://espn.mobi (espn dot mobi) and let us know what you think! Why would any one pay for itrans BART. You can get free back info from bartrider.com that looks to have the same information including the net arrival times. I have that on my ipod touch from the apple downloads.